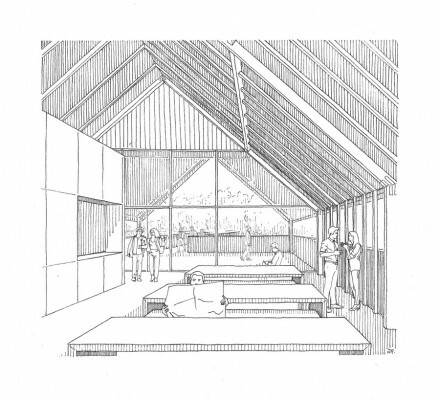 The London Borough of Bromley (Bromley Council) has recently received planning permission for a 2 storey café building designed by Chris Dyson Architects. The project is funded by the Mayor of London and Bromley Council. 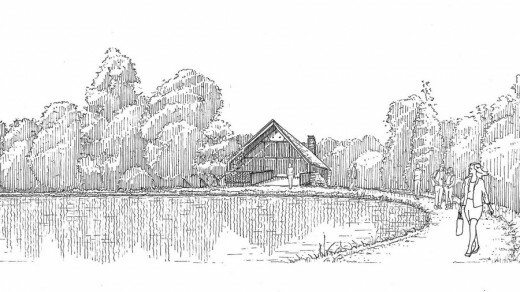 The pitched roof building is clad externally in half round shingles in a playful reference to the scaled skin of the Grade 1 listed dinosaur models at the other end of the lake, creating a connection between the new building and the dinosaur models which were sculpted in 1852. The shingles will cover both the walls and the roof. In a further reference to the skin of the dinosaurs this will make the building appear as a single entity. The building will provide a park level café with 60 covers and a 50 cover terrace, and an event space and covered terrace at first floor level. 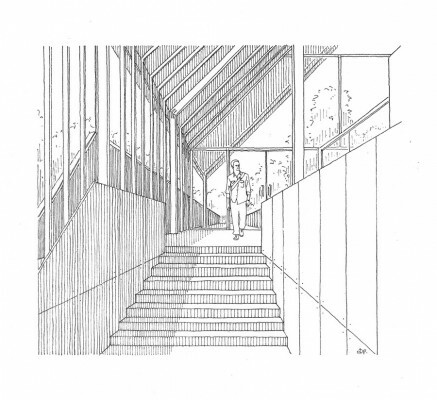 The first floor terrace is connected via a bridge to the lakeside path, improving the building’s connectivity with the lake and providing a second point of access to the building. 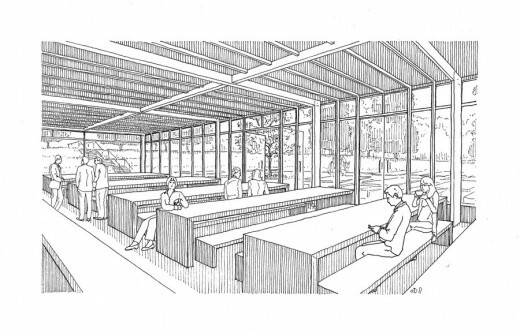 The café is designed to have four active façades, reflecting its setting within the park. Large amounts of glazing on the ground and first floors provide expansive views of the dinosaur models across the lake and panoramic views of the park. 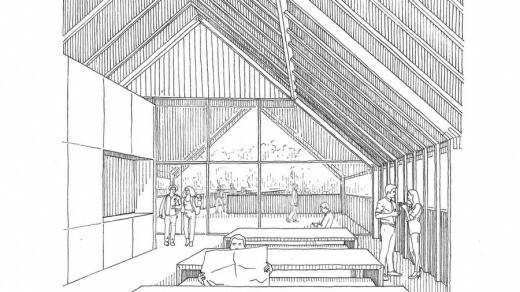 The first floor covered terrace is open on three sides. There is an open fire at the north end of both the ground and first floor rooms to encourage use of the café during the winter. 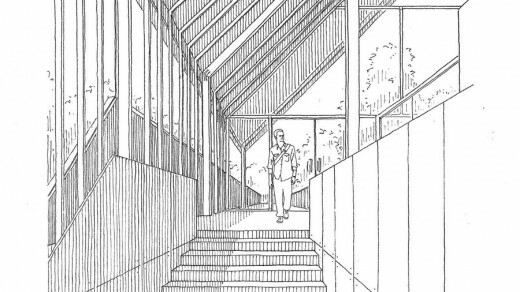 Carefully chosen areas of glazing maximise views over the park from within the café at ground level and over the lake from within the events space at first floor. A chimney stack in black brick adds a vertical element to the central axis end of the café, bringing warmth and a human scale to the building and acting as a landmark within the park, assisting wayfinding. The ground floor of the café will be stone and the first floor will be timber. The new building is situated in a similar location to the old cafe that it will replace, close to the Penge entrance. Its orientation has been shifted to be perpendicular to the park’s central axis, and the ground levels have been re-worked so that it can act as part of a new universally accessible route between the central axis and the lakeside path that leads to the grade 1 listed dinosaur models, which were built at same time that the Crystal Palace (now extant) was moved to Sydneham after the great exhibition of 1851. 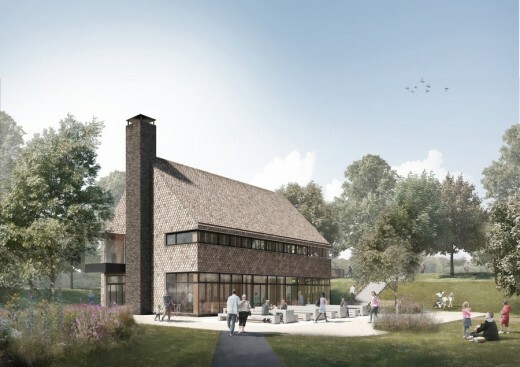 Stone and gravel bonded terrace and paths, and two trees will be planted which frame the view of the building and ground the terrace in the surrounding landscape. The trees selected are deciduous and have strong autumn colour which will provide a visual connection to the existing trees by the lake and dinosaurs. 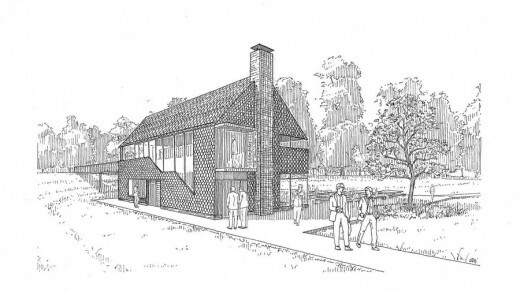 The café design is part of a package of improvements and conservation works proposed for the wider park. The approved design is a 2 storey building that provides a park level café and terrace and an event space at first floor level. The new café business will support the ongoing conservation of the unique dinosaur models and geological illustrations.